1-Use Scrapebox 2-Export to txt 3-Import into Platform and save results in folder.....Now what — . :: GSA SEO & Marketing Forum ::. I would like to cut costs and start making my own lists. import file into platform identifier - tick deep identify, save all to specified folder as site lists. 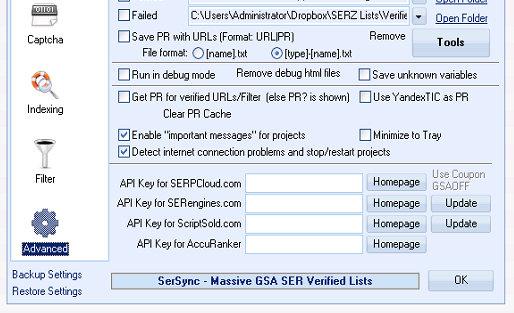 b) add the site lists into the verified folder that SER uses to try and post links to under options - advanced verifield folder. I have tried this numerous times, but I never seem to get any results at all, which makes me believe I am missing one crucial process.... any ideas would be highly appreciated. It's hard to say without knowing more about how you set things up. You mentioned you aren't seeing any results at all. When you run the project, what messages are you seeing in the logs? I did a raw scrape using keywords in scrapebox, then deduped, sorted into platforms with platform identifier. I then tested the results by importing target urls from one of the files created by platform identifier sitelist_Pingback and now I am getting 53 Lpm , 10Vpm. I do not see myself manually importing like this long term. The tutorial above looks great. I am going to give it a go so that I am not having to manually add new urls in. Just to confirm, scrape box and ser search different platforms? which means I need to start scrapes searching by footprint and not keywords? I guess this was something I was doing wrong. If you want to import your entire Scrapebox list, sorted by platform by GSA PI in one shot, copy the contents to %appdata%\Roaming\GSA Search Engine Ranker\site_list_identified. Then make sure in GSA SER>Options>Advanced you have configured one of your global site list folders to the folder your new scraped and PI sorted list import contains. @UnixSu- Exactly what @coneh34d said. 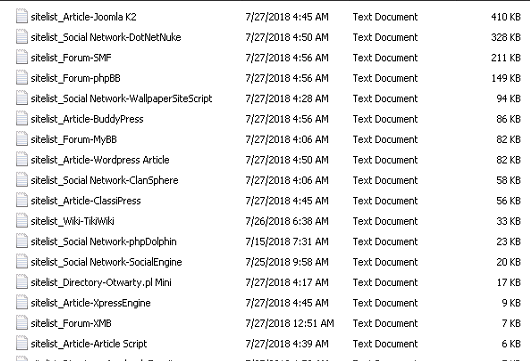 If you're using SB to scrape, you can merge footprints with keywords when you scrape and that will allow you to get a lot more results than if you just used keywords or just used footprints.